This morning a major crash was reported on LA Hwy 95 AKA Mire Highway just north of its intersection with Interstate 10. Officers from the Duson Police arrived to find a two vehicle head on collision each vehicle had one person in the driver’s seat with no passengers. Both drivers were trapped in their respective vehicles. 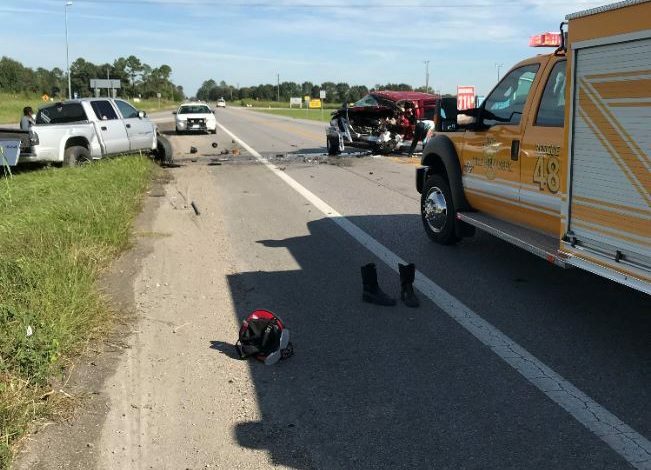 The initial results of the crash investigation indicate that 78 year old Filton Miller of Church Point, LA was driving a 2002 Ford F250 truck north on LA HWY 95 when for unknown reasons he crossed the center line and struck a south bound 2002 Dodge Dakota Truck driven by Dylan Leger 22 years old from Lafayette, LA. Miller was pronounced dead at the scene by the Acadia Parish Coroner’s Office. Leger was air lifted by Acadian Ambulance Air Med to Lafayette General Hospital where he is currently listed in stable condition. Routine toxicology tests are pending but no impairment is suspected at this time and the full report will be forwarded to the District Attorney upon completion of the investigation as is routine for fatal crashes. Update (10:37AM): One confirmed dead. According to Chief Kip Judice, one driver is confirmed dead, the other driver was transported to a local hospital with serious injuries. There were no other occupants in the vehicles. The Mire Highway from Duson to Mire is closed due to a major crash. No further information at this time, we will continue to bring you updates as they become available.